Napoli Hybrid is a favorite carrot among market growers and made famous thanks to Eliot Coleman, and it's no wonder! 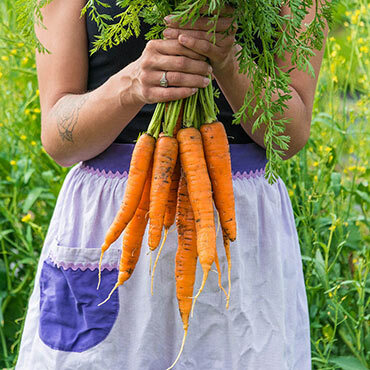 It's easy to grow, with a super-sweet flavor and crisp texture as an early spring or baby carrot. Each carrot is bright orange, cylindrical, smooth and slightly tapered with a blunt tip. They'll grow 7-8" long and 1.5" in diameter. They grow well in most soil types, whether sandy or loamy, and have strong, healthy tops that can reach up to 12". Because Napoli is so early to mature, it can be sown from very early to very late in the season for a wide production period. A great choice for overwintering! 45 days to maturity for baby carrots, 58 days to maturity for full-size carrots. Spacing: Plant seeds 1/4 inch deep and 1-2 inches apart, in rows 12 inches apart. Foliage: Strong, dark feathery fern-like green foliage grows 10-12 inches tall. Days to Maturity: 45 days-for baby carrots, 58 days-for full-size carrots. Fruit: Bright orange, cylindrical, smooth roots, slightly tapered, with a blunt tip. Roots are 7-8 inches long and 1 1/2 inches in diameter. Nantes-type carrot. Very sweet flavor. Dark green tops are strong, reaching 10-12 inches tall. Soil Preference: Light, fertile, deep, well-drained, sandy loam soil; pH 5.5-6.8. Size: 1 - 1 1/2 lbs.